Here is a fun piece of news, Hyperion Books is going to release a new book called HEAT WAVE on September 29, 2009. 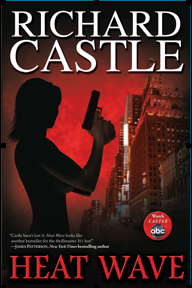 Now here is the thing, the book is “written by” Richard Castle, the lead character on ABC’s series, Castle. So if you’re a fan of the show, this is a book you might want to look into. A New York real estate tycoon plunges to his death on a Manhattan sidewalk. A trophy wife with a past survives a narrow escape from a brazen attack. Mobsters and moguls with no shortage of reasons to kill trot out their alibis. And then, in the suffocating grip of a record heat wave, comes another shocking murder and a sharp turn in a tense journey into the dirty little secrets of the wealthy… Secrets that proved to be fatal… Secrets that lay hidden in the dark until one NYPD detective shines a light. — As Nikki works to unravel the secrets of the murdered real estate tycoon, she must also confront the spark between them. The one called heat. You can pre-order Heat Wave on Amazon .